Happy Star Wars Day! 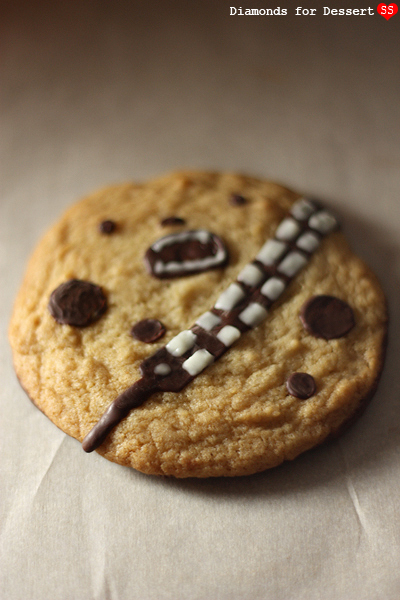 I made these Chewie Wookiee Cookies at the end of spring break for my brother (who's a huge Star Wars fan & loves CCCs) since his break was the week after mine and I wouldn't get the chance to see him. My mom suggested leaving him a note, but I thought cookies would be better (i.e. 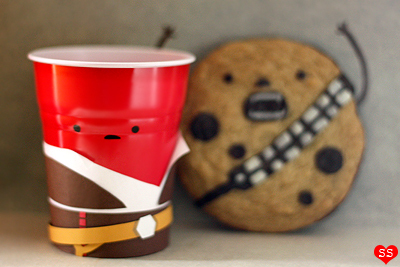 more delicious) :D.
So the story behind these cookies started a few years ago, when I saw Philip Tseng's "Han Solo Cup & Chewbacca the Cookie" (below) online. 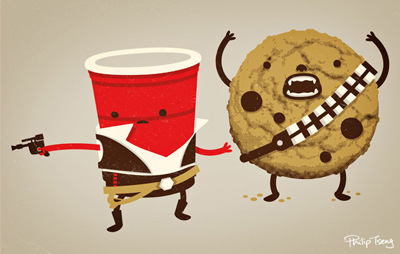 Seriously, baked goods and Star Wars in an adorable presentation; it does not get better than that. And you know I'm all about the food puns :). Btw, check out the other illustrations on his site for more food illustrations (even a "Cherry Pie-rate"! Remember my Apple Pie-rate Ship?) and pop culture references (Adventure Time, TMNT, Arrested Development, Fantastic Mr. Fox, Back to the Future, Gameboy). If you like them, many are available as t-shirts and prints! Okay, flash forward to last year. I was visiting my brother in LA and saw his new Threadless shirt, with that same graphic! After seeing it again, I knew I needed to bake these cookies. Plus I'd been hoping to make something Star Wars related for a while. 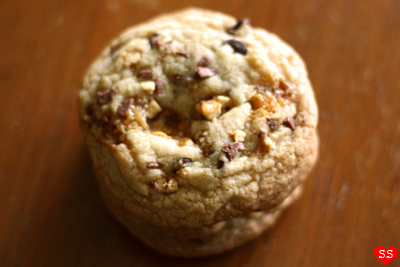 I took out my staple Thick & Chewy CCC cookie recipe and adapted it to this project. I knew I'd be decorating the cookies with chocolate, so I left out the chocolate chips (feel free to leave them in if you like things extra chocolatey). 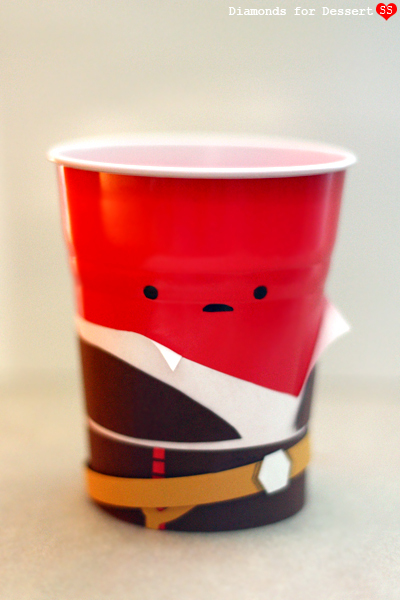 And since I had some mini red Solo-ish cups lying around, I busted out my craft skills and decorated one of them, because just like Han needs Chewie, cookies need a cup of milk. P.S. 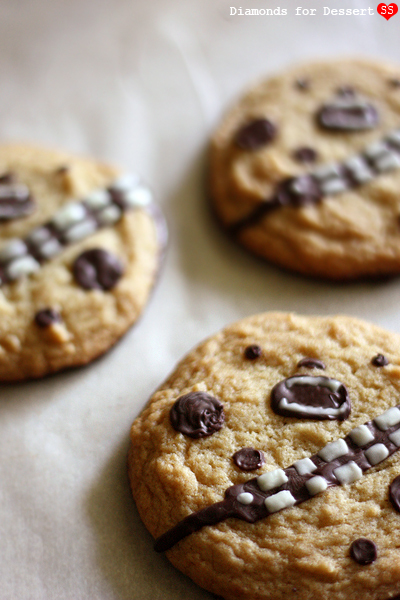 If you don't use all the cookie dough to make the Chewie Cookies, take the remaining dough, add chocolate chips, cut up some Snickers bars, and make Snickers stuffed CCCs! Make the Thick & Chewy CCC dough without the chocolate chips, and bake as indicated in the recipe. Let cool before decorating. To decorate, melt the semisweet chocolate. 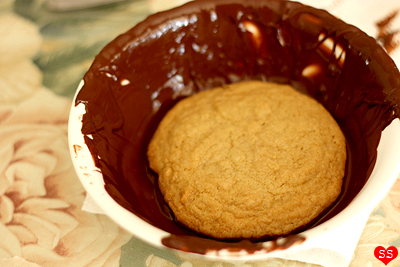 Dip the bottom of each cookie in the chocolate and place the cookies dipped side down on a piece of parchment paper. Let dry. 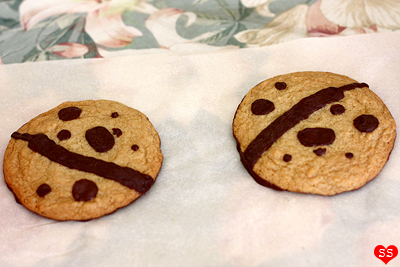 Remelt the semisweet chocolate and use it to trace the dark brown parts on each cookie (look at the illustration above). Wait for the chocolate to dry and set. Melt the white chocolate and use it to draw on the white parts of each cookie. Let the chocolate dry and enjoy. 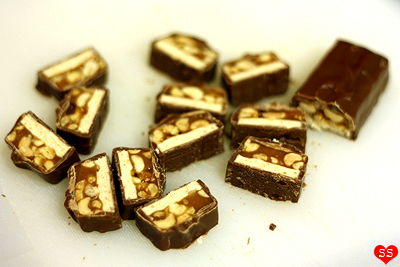 Use a sharp knife to cut 3 of the king sized Snickers bar into 8 pieces each. 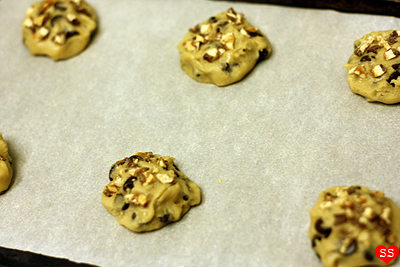 Chop up the last bar into little bits to sprinkle over the cookies at the end. Set aside for now. Preheat the oven. Make the cookie dough as indicated in the recipe. Split the dough into 24 parts. Take one piece of dough, flatten it between your palms, wrap up a Snickers piece, then place it on a parchment paper lined baking tray. Repeat with the other pieces of dough. Once finished, sprinkle all the cookies with the small bits of Snickers from the chopped up Snickers bar. Bake cookies according to the recipe. so fun! i'm sure your brother loved these, who wouldn't! always love your fun food creations! these look delicious! 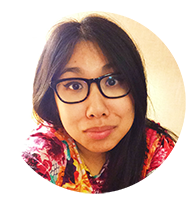 you have a really great blog here, I'm following you now! :) keep up the good work! 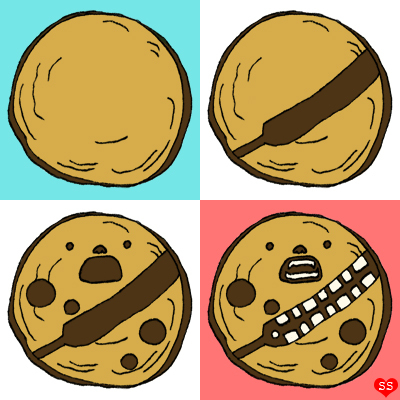 Animated cookies, this is fun. Hope I can try this one at home. Thank you for sharing this wonderful idea. Hope you can write more essay, in cooking and baking.